By late October the end is near for blooms in my garden. The last two perennials to peak are aster (Aster laevis 'Bluebird') above and Montauk daisies (Nipponanthemum nipponicum) below. 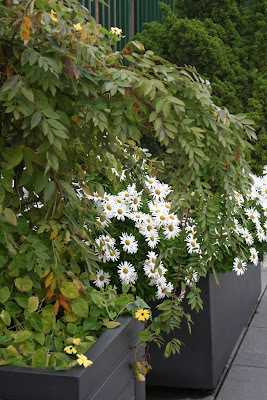 When I bought the asters mail-order from Bluestone Perennials this spring, the size of the plants fooled me into thinking I'd have flowers when my 7 year-old granddaughter graduated from high school. Wrong once again. Plants grown and shipped in pots less than 2.5" turned into this by October, despite the root competition. The rose 'Home Run' sent to me by Proven Winners is proving to bloom more prolifically late in the season than it's parent 'Knock Out' but has no better aroma or taste. Mine is a three season garden, as the 18th story roof in winter attracts only smokers out for a few quick puffs, no doubt discarding their butts on the pavers. I have zero interest in rewarding them with some special winter show-off. They'll have to content themselves with bare branches, a few evergreens and my favorite skyline view. Tell me what's starring in your garden right now? A 3 season garden! Awesome!! Now if only things grew in the winter! Whew! When I read "The End," I assumed you meant the end of your blog. Thankfully not. I guess it would have to be fall foliage. The flowers that look great? Few although 'Pink Sheffield' chrysanthemum is bright and beautiful. Those blooms still look pretty wonderful! Adele wrote me: "I wish to voice my momentary dismay at the title of your current blog... The title"The End" momentarily meant to me that the blog was ending." Guess I need an editor!